Northern Illinois University fullback Rob Sterling (Lansing, Ill./T.F. South) has been named one of 167 semifinalists for the 2014 National Football Foundation (NFF) Scholar-Athlete Awards, presented by Fidelity Investments. With the nomination, Sterling is also a semifinalist for the 2014 William V. Campbell Trophy, which recognizes one individual (from any level of college football) as the top scholar-athlete in the nation, the NFF & College Hall of Fame announced Thursday. While Sterling is one of 167 candidates for the NFF Scholar-Athlete Awards and Campbell Trophy, which is celebrating its 25th anniversary, he is one of 62 nominees from the Football Bowl Subdivision this year and one of only seven nominees from the Mid-American Conference. Each college football playing institution is limited to one nominee, and that individual must be a senior with an undergraduate grade point average of 3.2 or higher, outstanding ability as a first-team player or significant contributor and have demonstrated strong leadership and citizenship. NIU head coach Rod Carey, who has seen Huskies Nabal Jefferson and Chandler Harnish go on to earn NFF Scholar-Athlete Awards during his tenure at NIU, feels Sterling is more than qualified for this honor. 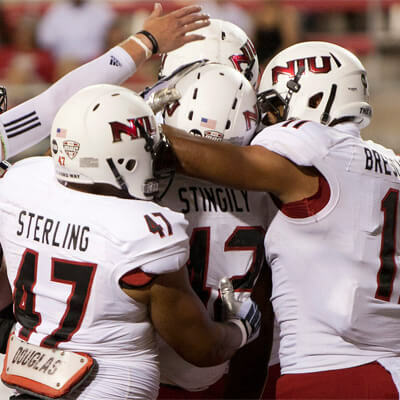 A three-year letterwinner at fullback for NIU, Sterling, who began his career as a walk-on before earning a scholarship in his sophomore season, has played in 41 games during his career, starting 15. One of four team captains for the Huskies in 2014, Sterling has caught four passes for 25 yards in his career. 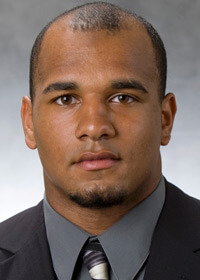 He also recorded receptions at Purdue, Kent State and versus Ball State. Sterling (47) joins in the celebration of a Cameron Stingily touchdown. Serving primarily as a lead blocker, he helped NIU set nine offensive school records in 2013 as the Huskie offense set the single season MAC records for rushing yards and rushing first downs while two players surpassed the 1,000-yard mark in rushing yards for the first time in school history. Sterling helped the NIU offense surpass 300 yards rushing five times, allowing the offense to average 5.4 yards per carry in 2012. He has also been very active in the DeKalb community since his freshman year. Sterling has given of his time volunteering at the DeKalb Nursing Home, the DeKalb Salvation Army and local elementary schools. He is a member of several organizations on campus including the National Association of Black Accountants, NIU Leadership Council and the John Henrik Honor Society. The NFF Awards Committee will select up to 16 recipients for the NFF Scholar-Athlete Award and those individuals will be finalists for the Campbell Trophy. Scholar-Athlete Award winners will receive an $18,000 postgraduate scholarship and will travel Dec. 9 to New York City December 9 where they will be honored during the NFF Annual Awards Dinner at the Waldorf-Astoria, and one member of the class will be announced live as the winner of the William V Campbell Trophy.